The National Institute for Automotive Service Excellence (ASE) Entry-Level certification tests are designed to show a level of practical knowledge-based workforce-readiness in candidates seeking a career in the automotive service industry. ASE Entry-Level certification tests are available for the Automobile, Collision Repair/Refinish and Medium/Heavy Truck segments (series). 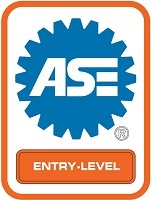 ASE Entry-level Certification is the first step in building career credentials as an automotive service professional. COMING SOON - Assess and prepare students before the certification exam. Practice tests relieve test anxiety while allowing instructors to intervene and achieve higher pass rates. Certificates are issued directly from ASE to the certified individuals.